Of the squares I have left to fill, I'm most worried about finding a Banned book and a Cult Classic that I actually want to read. (Any suggestions?) Celebrity worries me a little bit, too. The other categories should be fairly easy. ... I hope. 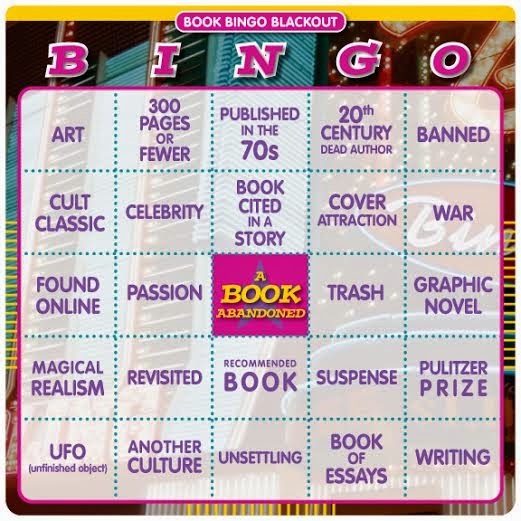 It's not too late to print out a card and start reading for your own bookish bingo. It's a lot of fun! 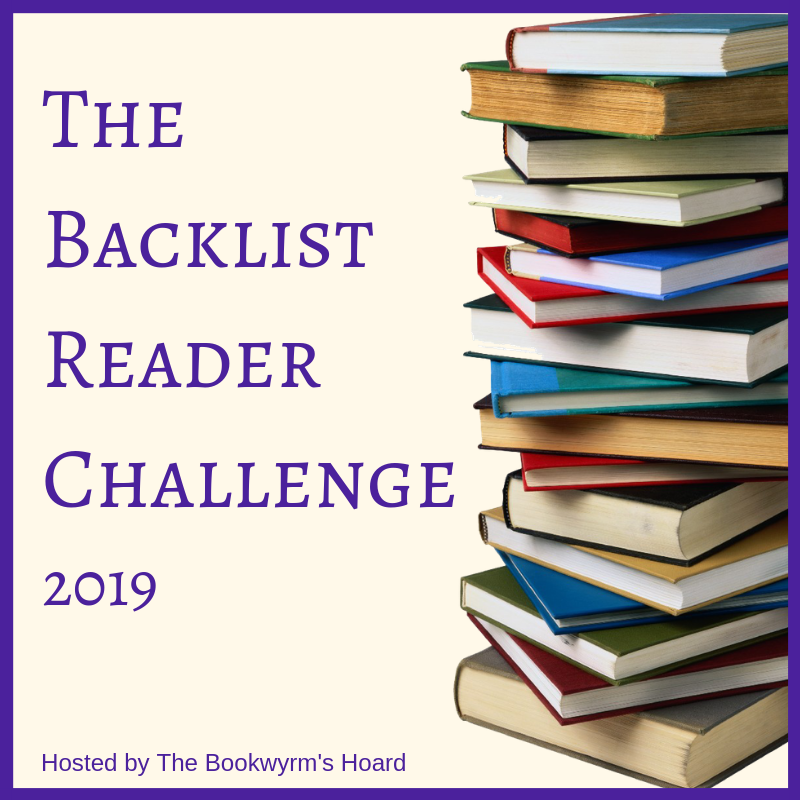 Of the 29 books still on my TBR shelf, I was most in the mood to read The Bride Wore Black Leather this month, but I had to read A Hard Day's Knight first. Both books are part of Simon R. Green's Nightside Series and have been sitting on my shelf for over a year. And if you've never read any of these urban fantasies, they are a lot of fun. The Nightside is a strange shadowy world hidden in the heart of London where it is always 3:00am. In the Nightside "you can find heroes and villains, gods and monsters, angels and demons". Here all your dreams can come true...and all your nightmares, too. John Taylor is a PI who lives in the Nightside. He wears a long white trench coat, has an infamous mother, and a gift for finding anyone or anything. And he's one of the people others in the Nightside fear most. In A Hard Day's Knight, the legendary sword Excalibur shows up on John Taylor's doorstep. John knows he's not worthy to wield that blade, but he's also the only one who can find and awaken King Arthur with it. But then Excalibur gets stolen, and there's an Elven civil war brewing, and if John doesn't fix things fast all of the Nightside will be destroyed. 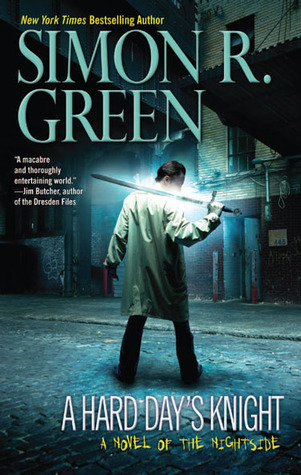 This was a fun ride of a novel, with the last knights of Camelot and Queen Mab, a missing sword, and the usual trouble that always follows John Taylor. 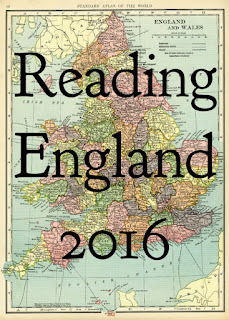 I have to say I really enjoyed reading it. 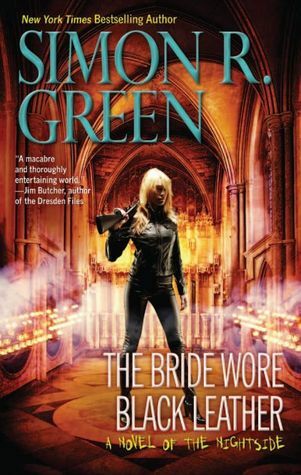 In The Bride Wore Black Leather, a new threat has come to the Nightside on the eve of John Taylor's wedding to Shotgun Suzie, a fearless and feared bounty hunter. The Sun King is determined to end the long night and bring a new dawn to the Nightside. Now John must find a way to stop him, save the Nightside, and still make it to the church on time (or Suzie Shooter just might shoot him). Ironically, considering the title of this book, Shotgun Suzie doesn't even make an appearance until the last 50 pages, but she comes in with a bang. I got the feeling Simon R. Green might be wrapping up the series with this one; if true, it's a good way to go out. After all, "all the best stories end in a wedding." There aren't a lot of authors whose last names begin with the letter X, at least, not at my library. And the few books I did find on the library shelf weren't ones I wanted to read. I was just about to give up on the letter X altogether when I remembered that April is National Poetry Month. So, I went to check out the 800s and serendipitously stumbled upon Notes on the Mosquito by Xi Chuan (translated by Lucas Klein). I love the imagery in his poetry; and found his later prose poems to be very powerful. But since I'm no literary critic, I'll let Xi Chuan's words speak for themselves. If I breathe, what will my heart think? If I vomit, what will my soul think? Depression. A suspended gong. A leopard dozing in the basement. A spiral staircase. A torch at night. A city gate. Cold that touches a blade of grass beneath an ancient constellation. Concealed flesh. Undrinkable water. An ice cube floating like a giant vessel. Its passenger a bird. A blocked canal. An unborn girl. Unformed tears. Unenforced punishments. Chaos. Balance. Ascent. Blankness... How can depression be discussed without error? Facing flower petals descending at a crossroads, consider the cost of desperate risk-taking. Civilization written on the seventh page of suffering. I want to shout, to force steel to echo, to force mice so accustomed to secrecy to line up before me. I want to shout, but I suppress my voice so I'm not abusive, so I whisper like the wind instead of booming like a cannon. Stronger heartbeats follow a greater silence; I see reserves of water drunk dry, so scream! Oh I want to scream, when a hundred crows cackle I have no golden tongue--I'm a bad omen. Too many desires, not enough seawater. Fantasies require capital for sustenance. Let roses correct our errors, let thunder rebuke us! On a slow journey, no asking the destination. The moment the moth hits the flame it's inopportune to discuss eternity, it's hard to find proof of perfection. Love: the unfinished business of the heart. All of Jane Austen's novels. They're smart and witty, they have memorable (and swoon-worthy) characters, and they're still popular 200 years after they were first published. Who wouldn't want to be the author of these amazing books? Then there are the books I wish I were artistic and clever enough to execute, like Nick Bantock's Griffin and Sabine Trilogy (gotta love his artwork!) and Caroline Preston's The Scrapbook of Frankie Pratt, a book told entirely in collage. How I'd love to be able to create something half as wonderful as these books. I also wish I'd written The Riddle-Master of Hed trilogy by Patricia A. McKillip. The writing in these novels is so amazing I find myself lingering over the lyrical prose and rereading certain poetical phrases and passages aloud. Oh, to be able to write like that! So, what books do you wish you had written? "She felt a sudden desire for perilous adventures." "...when you have finished Udolpho, we will read The Italian together; and I have made out a list of ten or twelve more of the same kind for you." "Have you indeed? How glad I am! What are they all?" "I will read you their names directly...Castle of Wolfenbach, Clermont, Mysterious Warnings, Necromancer of the Black Forest, Midnight Bell, Orphan of the Rhine, and Horrid Mysteries. Those will last us some time." "...but are they all horrid? Are you sure they are all horrid?" 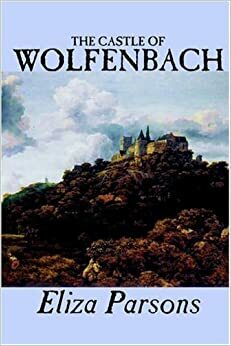 The Castle of Wolfenbach by Eliza Parsons is one of those "horrid novels" mentioned (and mocked) by Jane Austen in Northanger Abbey. It's a classic Gothic novel of virtue vs. villainy and it is full of Gothic cliches. The main character, Matilda Weimar, is an orphan who must flee her guardian's questionable protection. She stumbles upon Castle Wolfenbach which is purportedly haunted. There she meets Victoria, the Countess of Wolfenbach, who has a scheming and evil husband and a dark secret of her own. In the first 48 pages alone there is an abduction, a mystery, a murder and even arson. Matilda's fate and Victoria's virtuous struggle to free herself from her villainous husband, along with romance and many declarations of love, take up the rest of the novel. But, as Eliza Parsons promises, Providence favors these "poor creatures" in the end. This isn't the worst novel ever written, but it's not the greatest either. 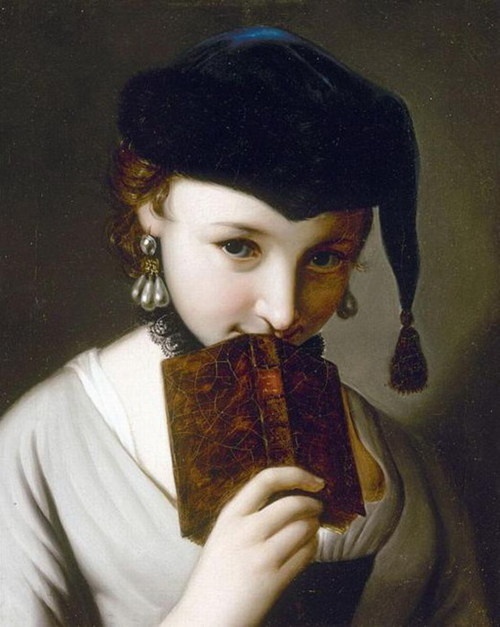 Still, I tried to enjoy it for what it is--one of those "horrid novels" that Jane Austen poked fun of, with damsels in distress, too many counts and countesses to count, overwrought situations, and more than enough moralizing. Towards the end, I found myself heartily agreeing with one of the characters when she exclaimed: "Let's have no more dismals; I declare these last five days have vapored me to death." 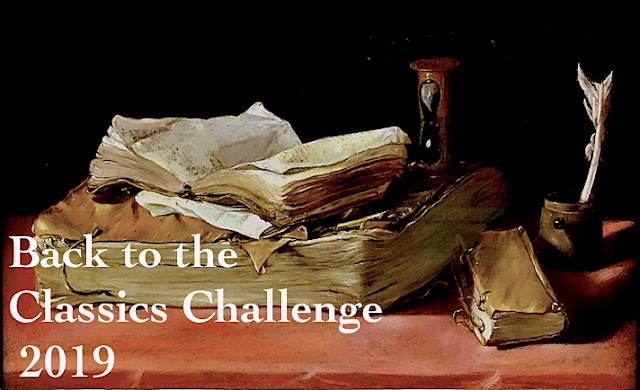 But I got through it and completed another category in the 2015 Back to the Classics Challenge: read a classic novel written by a woman author. As a bookish bonus, it's also one more book checked off my TBR list. James M. Tabor defines "supercaves" as vast geologic monsters that are miles long and many thousands of feet deep; they are rare and as difficult to conquer as Mt. Everest. Their hazards include darkness, vertical drops, fatal falls, hypothermia, fissures, rock slides, hurricane-force winds, dangerous microbes, asphyxiation and poisonous gases. They also have turquoise pools, cascading waterfalls, beautiful water-carved limestone formations, and caverns immense enough to hold several Greyhound buses. I find them alluring and completely fascinating, but the thought of actually exploring one scares me to death. So I read about them instead. 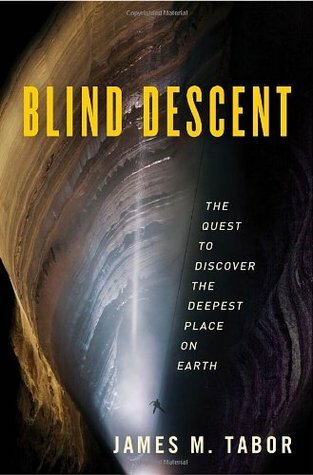 In Blind Descent, James M. Tabor chronicles the stories of two men--American Bill Stone and Ukranian Alexander Klimchouk--two caves, and two quests to find the deepest place on earth. It's Cheve Cave in southern Mexico vs. Krubera Cave in the Republic of Georgia. Both are incredible supercaves, and both pose great risks to anyone who enters them. And Tabor does a masterful job of taking the reader on an incredible journey deep into the center of the earth. It's a memorable and well-written true life adventure story. 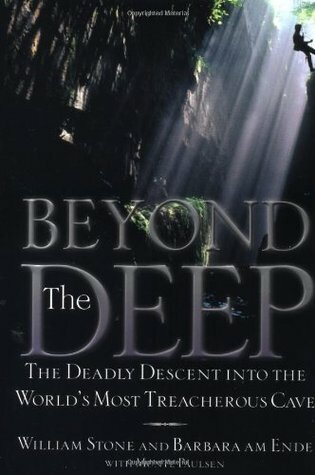 But my favorite caving adventure is told in William Stone's and Barbara am Ende's Beyond the Deep: The Deadly Descent Into the World's Most Treacherous Cave. This firsthand account of Stone's 1994 expedition into Huatla Cave in Mexico is 'unputdownable'. What the cavers experience is scary, and sometimes deadly, and very hard to forget. Talk about going where no one has gone before! Both of these bookish descents into darkness are compelling reads that I absolutely loved! 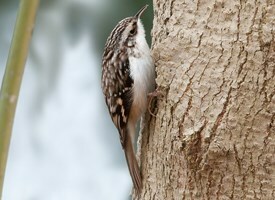 So far this year I've added three new birds to my bird list: a snow goose, a brown creeper, and a great horned owl. Can you believe it? A pair of great horned owls have been nesting at the Salt Lake City Cemetery for the past six years. They are incredible birds. And I finally spotted one!! I'm closing in on my 150th bird...maybe this summer. On waiting too long. 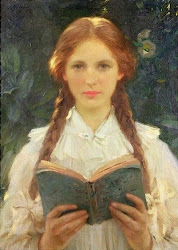 There are some books that need to be read when the mood strikes, because if you wait, the mood to read that particular book may never come again. It's almost like some books have a built-in expiration date; if you let them sit on your shelf for too long they lose their freshness and charm. I'm not sure why. (And maybe it only happens to me.) I just know that there are one or two books sitting on my shelf that I really wanted to read once upon a time...and now I don't. I guess for me, they've passed their bookish expiration date. On spring-cleaning my "To Read" list. I collect titles of books that I want to read from a variety of places: other bookish blogs, bookstores, Goodreads, from my sisters and friends, even from the bestseller lists. Needless to say, my list is long. Too long. So I went through it the other day and did some spring-cleaning. If I didn't remember what a book was about, or why I had put it on the list in the first place, I crossed it off. Then there were all those out-of-print books that I haven't been able to find; I crossed them off, too. It's time to move on. Some books on my list I no longer want to read (even though I once did); they were the next to go. And what about those titles I find myself skipping over every time I'm looking for my next read? I got rid of those, too. It felt good. In the end, my To Read list is still too long, but it no longer feels impossible, and at least I know I want to read all the books on it. Eventually. Three years, ten months, and twelve days. That's how long Reeve LeClaire was held captive in a dark basement, tortured and raped by her captor. 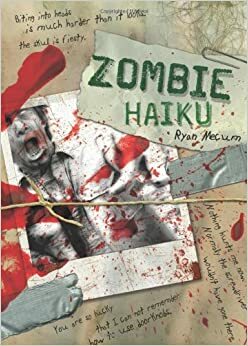 It's six years later and Reeve, now 22, is still recovering from her ordeal; she only needs to meet with her psychiatrist, Dr. Lerner, once a week, she only has a part-time job, and the nightmares have mostly stopped. Until another young kidnap victim is found: Tilly Cavanaugh. Dr. Lerner thinks Reeve is just the person to offer Tilly the support she needs. What he doesn't know, and what Reeve is about to find out, is that the mastermind behind Tilly's kidnapping is still out there, keeping both girls under surveillance. And as long as he's around, neither girl is safe. Watching this dominating and smart sexual predator close in on Reeve, and being helpless to stop him, makes this novel genuinely creepy. Especially when no one else is even aware of his existence. 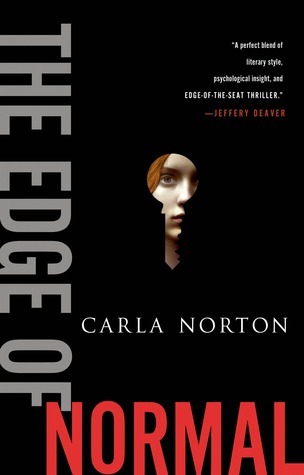 The Edge of Normal by Carla Norton is psychological suspense at it's best--it's dark and compelling, but not too disturbing or graphic. But what really makes this memorable thriller a cut above the rest is Reeve herself. What a great character! For all her fragility, Reeve is surprisingly tough. She's also smart and resourceful. And I really liked her. She's the type of heroine you could write an entire series around...and I hope Norton does.